1. 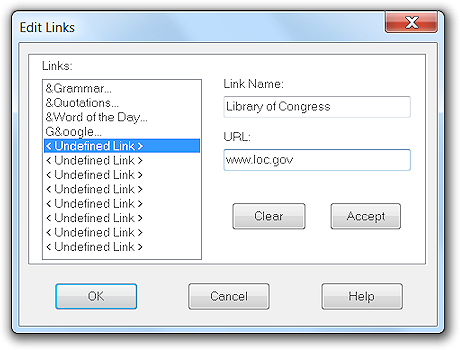 Select one of the undefined links in the list of links. 2. Enter a name for the new link in the Link Name field. If an ampersand character is used in the name then the character it precedes will be designated as the menu item's shortcut key in the More Links menu. 3. Enter a URL in the URL field. The URL can be either an Internet address or a file address to a program installed on your computer (details). In our example, an Internet address of www.loc.gov is specified. That is the address of the Library of Congress web site. It is also possible to look up the Reference Bar's target word at a specified URL (details). 4. Click the Accept button and then the Ok button. Now, a "Library of Congress" menu item appears in the Reference Bar's More Links menu.